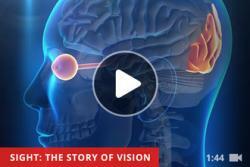 This documentary tells stories of individuals who struggle with vision loss and blindness. Stories include an Iraqi war veteran’s vision loss due to a traumatic brain injury and a woman who is losing both her sight and hearing yet, refuses to stop achieving her dreams.The film also presents the complexities of human vision and the exciting future that lays ahead with new technologies and medicine only imagined a few years ago. WXXI is pleased to present SIGHT: The Story of Vision airs on Tuesday, January 15 at 8 a.m. on WXXI-WORLD. It also airs Saturday, January 19, 2019 at 5 p.m. on WXXI-TV.